Anti-neutrophil cytoplasmic autoantibody (ANCA) disease rarely occurs in African Americans and risk factors for the disease in this population are unknown. Here, we genotyped MHC class II alleles and found that, among African Americans, those with proteinase 3–ANCA (PR3-ANCA) had 73.3-fold higher odds of having HLA-DRB1*15 alleles than community-based controls (OR 73.3; 95% CI 9.1 to 591). In addition, a disproportionate number of African American patients carried the DRB1*1501 allelic variant of Caucasian descent rather than the DRB1*1503 allelic variant of African descent. Among Caucasians, those with PR3-ANCA had 2.2-fold higher odds of carrying DRB1*1501 than controls (OR 2.2; 95% CI 1.2 to 4.0). A validation study supported by the Vasculitis Clinical Research Consortium confirmed the strong association between the DRB1*15 allele and PR3-ANCA disease, among African Americans. Furthermore, we found that DRB1*1501 protein binds with high affinity to amino acid sequences of sense-PR3, purportedly an antigenic epitope, and to the amino acid sequence complementary to this epitope in vitro. Peptides of sense-PR3 and complementary-PR3 also bound to TNF-α–induced surface expression of DRB1*1501 on peripheral neutrophils. Taken together, these data suggest HLA-DRB1*15 alleles contribute to the pathogenesis of PR3-ANCA disease. Genetic factors purportedly contribute to anti-neutrophil cytoplasmic autoantibody (ANCA) disease as evidenced by reports that disease occurs in siblings,1,2 and within families.3,4 Particularly pertinent to the present studies, there are differences in racial incidence.5,6 ANCA disease is rarely seen in African Americans.7 The total number of African American patients with biopsy-proven vasculitis diagnosed between 1985 and 2009 and in an inception cohort followed in the Glomerular Disease Collaborative Network (GDCN), equaled 58 compared with 449 Caucasians. Comparisons between African American and Caucasian patients (Supplemental Table 1) indicate that disease occurs at an earlier age in African Americans and it is common for them to be resistant to initial treatment. These patients tend to progress to end-stage kidney disease more frequently (Supplemental Figure 1). The present study was motivated by a curious observation that 3 out of 3 African American, proteinase 3–ANCA (PR3-ANCA) disease patients enrolled in a previous T cell study were genotyped as DRB1*15-positive.8 The studies herein determine whether the DRB1*15 allele predisposes African Americans to develop ANCA disease, or more to the point, if it is a significant factor in ANCA disease regardless of race. If not, then are there other DRB1 alleles associated with ANCA disease in our patient cohort. The experimental study cohort included a total of 137 patients who had donated a DNA sample: 41 African Americans (16 PR3-ANCA and 25myeloperoxidase-ANCA [MPO-ANCA]) and 96 Caucasians (74 PR3-ANCA and 22 MPO-ANCA). Samples were genotyped at the DRB1 and DQB1 loci using low-resolution analysis (Supplemental Table 2). With use of the statistical method of relative predispositional effects (RPEs),9 DRB1*15 was identified as a significant allele associated with disease in African Americans (P = 0.0003) (Supplemental Table 3A), compared with the gene frequency within the local community (Carolina Organ Donor Services). The DRB1*15 allele was also a significant contributor to disease in Caucasian patients (P = 0.0008) (Supplemental Table 3B). Reanalysis after subdividing the total patient group into PR3-ANCA versus MPO-ANCA groups show that this allele is primarily associated with PR3-ANCA disease and not MPO-ANCA disease (Supplemental Table 3, C through F). The greatest risk for PR3-ANCA disease in African Americans was DRB1*15 (P = 5.52 × 10−11) and in Caucasians (P = 0.0001). DRB1*16 was significant in the African American MPO-ANCA disease group, whereas no DRB1 allele was significant in the MPO-ANCA Caucasian group (Supplemental Table 3, E and F). We asked how expected gene frequency values of North Carolina Organ Donors compare with the U.S. database of African Americans-Bethesda and Caucasians-Bethesda. Repeating the RPE analysis using the Bethesda gene frequencies for control values, we found the results similar, identifying DRB1*15 as a risk factor for PR3-ANCA disease in African Americans (P = 2.90 × 10−7) and Caucasians (P = 0.0004) (Supplemental Table 4, A through D). Genotypes of DRB1*15 were confirmed by high-definition PCR-SSOP analysis, which also provided allelic variant information (DNA samples from four patients were no longer available). Allelic variants DRB1*1501 and DRB1*1503 were significantly disproportionate in the African American patients; DRB1*1501 (50% patients versus 12.5% controls, P = 0.01), whereas the DRB1*1503 allele was underrepresented (50% patients versus 80% controls, P = 0.04) (Supplemental Table 5). This is particularly interesting because the DRB1*1501 allelic variant is of Caucasian descent, whereas DRB1*1503 is of African American descent.10 All Caucasian patients were DRB1*1501. To validate the data in a different cohort of patients, the Vasculitis Clinical Research Consortium (VCRC) provided us with all available samples from African American patients with vasculitis. In the meantime we enrolled six new patients into the GDCN, giving us a total of 16 new patients (Table 2A). Seven of nine PR3-ANCA–positive African American patients carried the DRB1*15 genotype. Interestingly, the two patients who carried the Caucasian allelic variant (*1501) were both from Alabama. Statistical analysis using “control” frequencies based on the North Carolina Organ Donor population gave an odds ratio of 17.1 (Table 2B), which was statistically larger than equal odds of 1.0 (P = 2.9 × 10−4). None of the MPO-ANCA and ANCA-negative samples were positive for DRB1*15. We also compared the frequencies of DRB1*15 carriers with “control” frequencies from the U.S. African American-Bethesda database (odds ratio: 12.1, P = 0.001) and U.S. southeast African American database (odds ratio: 11.6, P = 0.001). When we combined the data from the GDCN and VCRC studies, 22 out of 25 African American PR3-ANCA patients were DRB1*15 genotype, giving an odds ratio of 35.9, P = 3.0 × 10−11 (Table 2B). In the validation study 2 out of 7 (29%) were *1501 versus *1503, which is still higher than the 13% in the general population. Interestingly, these two DRB1*1501-positive patients were from Alabama, which would be 2 out of 5 (40%) from that cohort. Next, we asked if DRB1*15 could be involved in antigen presentation by investigating its potential to bind sense-PR3 and/or complementary-PR3. Over the past few years, we have explored the possibility that “complementary protein pairs”—a pair of proteins composed of an autoantigen and a protein coded by antisense RNA of the same gene—contribute to incitement and generation of anti-idiotypic antibodies, one of which is the pathogenic autoantibody.13 One supposition would be that the MHC DRB1*15 molecule has the potential to present both the self antigen and its complementary counterpart. A primary peptide chosen for study contains the reported antigenic epitope for PR3-ANCA (sense-PR3149–163).14–16 The sequence of the complementary-peptide was read from codons opposite of the sense codons. Immune Epitope Database and Analysis Resource (IEDB) database (http://www.immuneeDitope.org/home.do) predicts IC50 binding affinities for >14 MHC molecules.17 Two peptides from sense-PR3 and three peptides derived from complementary-PR3 sequence were predicted to bind DRB1*15 protein (Figure 1A). Actual binding assays demonstrated sense-PR3117–131 and its counterpart comp-PR3107–121 bound DRB1*1501 with high affinity similar to theoretical predictions (Figure 1B). Notably, sense-PR3149–163 peptide, which is a reported antigenic epitope for PR3-ANCA,14–16 had a slightly higher affinity than predicted. Moreover, this peptide's complementary-peptide counterpart, comp-PR3146–161, also bound DRB1*1501. 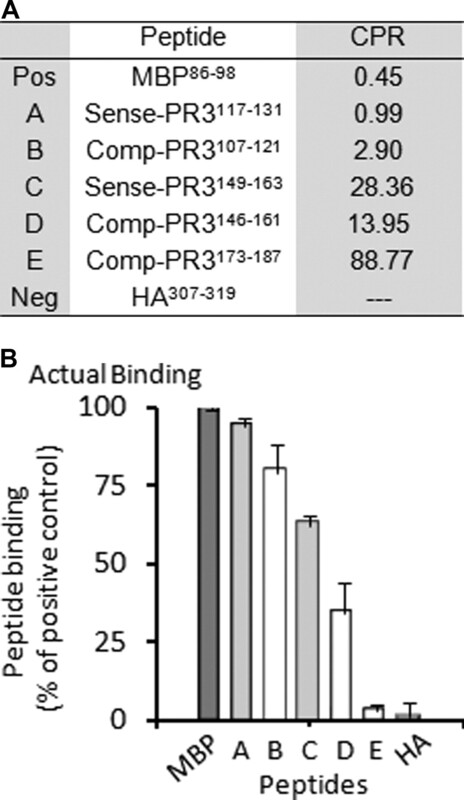 Specificity of binding was demonstrated by comp-PR3173–187 peptide predicted not to bind DRB1*15 and the actual results were negative (Figure 2B). DRB1*15 binds sense-PR3 and comp-PR3 peptides. (A) In silico analysis of DRB1*15 binding capacity for peptides were predicted according to the Consensus Percentile Rank (CPR)-Immune Epitope Database and Analysis Resource (IEDB). Interpretation of predicted affinities: IC50 nM values <50 = high affinity; IC50 values <500 = intermediate affinity; IC50 values <5000 = low affinity. No known T cell epitope has an IC50 value >5000. Thus, low values indicate high affinity and conversely high values indicate low affinity: Positive control, myelin basic protein (MBP), and negative control, hemagglutinin (HA) peptides, were used for reference binding. (B) In vitro analysis of DRB1*15 affinity for peptides using a capture ELISA assay. MGAR cells (a line of EBV-transformed human B cells homozygous for DRB1*1501) were used as a source for DRB1*1501 protein. Each optical density (OD) value was adjusted for nonspecific binding by subtracting the coordinate mock control OD value (normal mouse IgG). Binding is expressed as percentage of MBP binding. Graph represents three or more independent experiments. DRB1 expressed on the surface of neutrophils for binds sense- and complementary-PR3 peptides. Neutrophils were gated (circle). 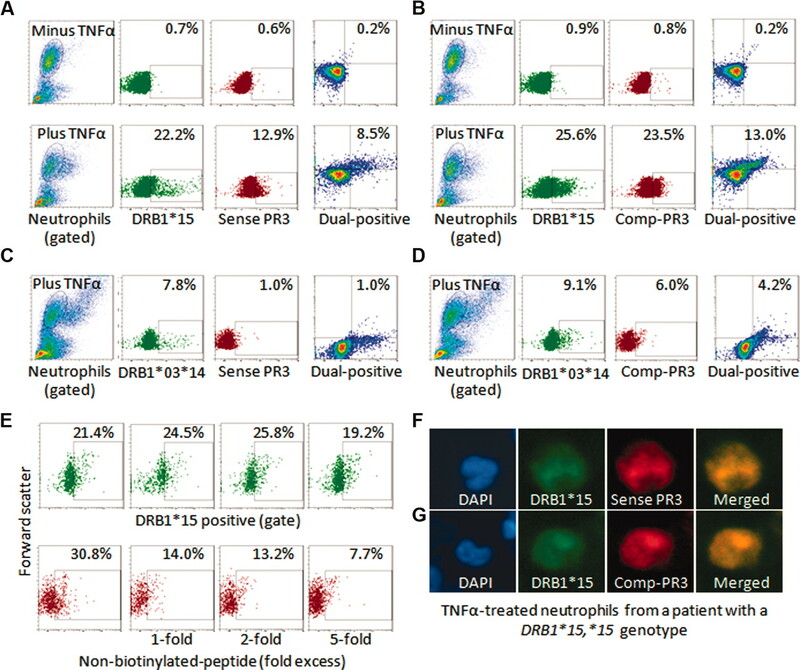 After TNF-α priming, a subset of neutrophils expressed surface DRB1*15, which bound sense-PR3149–163 peptide (A and C) and comp-PR3146–161 peptide (B and D). A plot of DRB1 versus sense-PR3149–163 peptide showed dual labeling (right upper quadrant). (C) DRB1*03, *14 did not bind sense-PR3149–163 peptide (C) but did bind comp-PR3146–161 peptide (D). Specificity of peptide binding as determined by a competition assay—excess nonbiotinylated–comp-PR3146–161 peptide competed with DRB1*15 binding of biotinylated–comp-PR3 (30.8 to 7.7%) in a concentration-dependent manor (nonbiotinylated–comp-PR3146–161 peptide: 0, 10, 20, and 50 μg/ml). (E) Neutrophils from a DRB1*15,*15 patient was positive for surface HLA-DRB1 antigen (green). DRB1-positive cells (green) bound sense-PR3149–163 peptide (red) (F) and comp-PR3146–161 peptide (red) (G). Merged images indicate co-localization (F and G). In conclusion, African Americans with PR3-ANCA disease are far more likely to have the DRB1*15 genotype than African Americans in the local population (odds ratio of 35.9). The strength of this association is unparalleled. Strikingly, 22 out of 25 African Americans with PR3-ANCA disease carry at least one HLA-DRB1*15 allele and almost half of these carried the allele of Caucasian descent (DRB1*1501). Lastly, it appears that neutrophils have the ability to present the sense and complementary peptides with the help of MHC-DRB1*1501 protein supporting a mechanism by which DRB1*1501 antigen influences susceptibility to PR3-ANCA disease. Patients with biopsy-proven ANCA small vessel vasculitis enrolled in this study were diagnosed between 1985 and 2009, and followed in a life-long registry by physicians in the Glomerular Disease Collaborative Network (GDCN). The GDCN as well as methods of identifying and enrolling patients have previously been described.7,24–26 Study patients gave informed, written consent and participated according to UNC Institutional Review Board guidelines. A total of 507 patients (58 African American and 449 Caucasian) were enrolled for clinical comparison by race. ANCA patients' clinical information, including diagnosis, ANCA subtypes, organ involvement, treatment categories, and histopathologic renal evaluations and outcomes, were determined by previously described criteria.7,24–26 Race was self-identified by the patients and as recorded in their medical records. Individuals of other or mixed racial groups were excluded. ESRD was measured by the loss of renal function requiring maintenance dialysis or kidney transplantation, whichever was first. Among the above cohort, 41 African Americans (mean age: 47 years, range: 6 to 87; 18 men and 23 women) and 96 Caucasians (mean age: 50 years, range: 10 to 86; 54 men and 42 women) for whom we could attain a DNA sample were genotyped for MHC class II. Gene frequencies within the local community were attained from Healthy Organ Donor in North Carolina Services, consisting of 106 African Americans and 273 Caucasians. Genomic DNA was extracted from EDTA-treated peripheral blood samples of 32 African Americans and 96 Caucasian ANCA patients using the Puregene DNA Purification System (Puregene, Minneapolis). As for the nine deceased African American ANCA patients, genomic DNA was extracted from the frozen biopsied-kidney samples using the Magnesil Genomic Fixed Tissue System (Promega, Madison, WI). DNA purity was determined using Nanodrop (Thermo, Wilmington, DE) 260/280 nm ratios. Low-resolution HLA-DRB1 typing was performed by PCR using sequence-specific primers (PCR-SSP) with the DR/DQ 2T locus SSP Unitray System (Invitrogen) in accordance with manufacturer's instructions. Results were evaluated with the SSP Unimatch software (Invitrogen). High-resolution genotyping was performed only on HLA-DRB1*15 individuals (12 African Americans and 27 Caucasian ANCA patients) and on the 9 individuals whose samples were from tissue biopsy (all MPO-ANCA patients), using LABType SSO kits with the Luminex LabScan Flow Analyzer (One Lambda, Canoga Park, CA). Data were analyzed with MHC Fusion Software (One Lambda). The low-resolution genotyping data of controls was provided by the United Network for Organ Sharing. Frequencies within the general African American population for allelic subtypes HLA-DRB1*1501, -*1502, -*1503, and -*1504 were obtained from the Allele Frequency Database (http://www.allelefrequencies.net). To procure samples for a validation study, a proposal requesting DNA was submitted to the Vasculitis Clinical Research Consortium (VCRC), an integrated group of academic medical centers, patient support organizations, and clinical research resources dedicated to conducting clinical research in different forms of vasculitis. They approved the proposal and provided us with all available samples from African Americans with vasculitis (Table 2, A and B). Four HLA-DRB1*1501 homozygous patients and four patients who were DRB1*04,*14, DRB1*03,*14, DRB1*01,*04, DRB1*07,*12 genotype were analyzed. For determination of intracellular DRB1 protein, leukocytes in blood were fixed and erythrocytes were lysed using FACS Lysing Solution (Becton Dickinson, San Jose, CA) and leukocytes were further permeabilized using FACS Permeabilizing Solution 2 (Becton Dickinson) according to manufacturer's instructions. Cells were incubated with mouse polyclonal anti–HLA-DRB1 (1:40) (Abnova) and followed with FITC-AffiniPure F(ab′)2 fragment donkey anti-mouse IgG (H+L) (1:200) (Jackson ImmunoResearch, West Grove, PA) for 15 minutes each at RT. Cells were fixed with 1% paraformaldehyde and analyzed by FACScan linked to a CELLQuest software system (Becton Dickinson). MGAR cells served as a positive control. To study binding capabilities of neutrophil surface-expressed of HLA-DRB1 protein, cells were stimulated with recombinant TNF-α (2 ng/ml) (R&D Systems, Minneapolis) in blood for 30 minutes at RT. Blood samples with or without TNF-α treatment were aliquoted into tubes, 100 μl each. Mouse polyclonal anti–HLA-DRB1 (1:40) with biotinylated-sPR3149–163 or -comp-PR3146–161 peptide (10 μg/ml) were added separately for 15 minutes at RT. For the completion experiments, DRB1 antibody with biotinylated–comp-PR3146–161 (10 μg/ml) and nonbiotinylated–comp-PR3146–161 peptides (0, 10, 20, and 50 μg/ml) were added separately to blood samples. Cells were incubated with FITC-AffiniPure F(ab′)2 donkey anti-mouse IgG (H+L) (1:200) to stain DRB1 and PE-streptavidin (1:200) (Becton Dickinson) to stain peptides for 15 minutes. Erythrocytes were lysed with FACS lysing solution. The remaining leukocytes were fixed with 1% paraformaldehyde after washing and analyzed by FACScan linked to a CELLQuest software system. Mouse polyclonal anti–MHC-DRB1 without peptides or normal mouse IgG with and without each peptide was served as negative controls. For immunofluorescence, the above-stained leukocytes were incubated with DAPI (0.1 μg/ml), cytocentrifuged onto Superfrost/Plus microscope slides (Fisher, Fairlawn, NJ), mounted in a Vectashield mounting medium (Vector Laboratories, Peterborough, U.K.), and viewed with an Olympus BX61 microscope (Olympus, Minneapolis). Optimum excitation wavelengths for DAPI (350 nm), FITC (488 nm), and PE (543 nm) were used. Comparisons between racial groups for categorical measures were performed using χ2 tests or Fisher exact tests for small sample size. Continuous measures were compared using Wilcoxon rank sum tests. Odds ratios and 95% confidence intervals were computed to compare the relative odds for an individual to have a particular MHC subtype between racial groups and between ANCA types, as compared with control frequencies. To determine the relative effects of the DRB1 alleles in predisposing to–or protecting against–ANCA disease, the statistical method of “relative predispositional effects (RPEs)” was performed. This method sequentially compares allele frequencies in patients and in controls to determine the overall frequency distribution of alleles using a χ2 test to detect significant deviations.27 To identify the allele with the greatest predispositional effect, the individual alleles are reviewed for their contribution to the overall χ2 value. For the allele with the largest deviation, the frequencies are compared using a Z statistic. The procedure is repeated with exclusion of the allele/s significant deviations in the prior step; thereby, the relative predispositional effects of the “other” alleles can readily be determined. This sequential process of identifying associated alleles and removing them is continued until no significant overall deviation is observed. Actual kidney survival was calculated using the Kaplan-Meier estimators. The probability of survival for the two racial groups was compared using a log rank test. A P-value of 0.05 or less was considered statistically significant. All statistical analyses were performed using SAS statistical program (SAS Institute, Inc., Cary, NC). This work was supported by NIDDK/NIH Grant 2PO1DK. We express our appreciation for the participation of the Vasculitis Clinical Research Consortium (VCRC) and the WGGER Research Group in the validation studies. Investigators include the following: Dr. Simon Carette (University of Toronto, Toronto, Ontario, Canada); Dr. Paul F. Dellaripa (Brigham and Women's Hospital, Boston, MA); Dr. Jeffrey C. Edberg (University of Alabama at Birmingham, Birmingham, AL); Dr. Gary S. Hoffman, Dr. Carol A. Langford (Cleveland Clinic, Cleveland, OH); Dr. Nader A. Khalidi (McMaster University, Hamilton, Ontario, Canada); Dr. Alfred D. Mahr (Hôpital Saint-Louis, Paris, France); Dr. Paul A. Monach, Dr. Peter A. Merkel (Boston University School of Medicine, Boston, MA); Dr. E. William St. Clair (Duke University Medical Center, Durham, NC); Dr. Philip Seo (Johns Hopkins University, Baltimore, MD); Dr. Ulrich Specks, Dr. Steven R. Ytterberg (Mayo Clinic, Rochester, MN); Dr. Robert F. Spiera (Hospital for Special Surgery, New York); Dr. John H. Stone (Massachusetts General Hospital, Boston, MA). The VCRC is supported by NIH grants U54 RR019497 and U54 AR057319 and grants AR-47785 and R01AR047799. The authors also thank John Vrnak from the UNC Center for AIDS Research Immunology Core for assistance with HLA typing. We express our thanks and appreciation to Meghan Free for assistance in producing the figures of the flow cytometry data.